An independent band with self-described “Cali-vibes,” Radical Something presents a fusion of reggae, hip-hop, and pop. On Sept. 2 the band released its second album, titled “Ride It Out,” bringing their familiar sounds of hip-hop drum samples, heavy bass lines, reggae rhythms, crisp vocals, and easygoing lyrics that spread messages of love, happiness, and living life the way one wants. 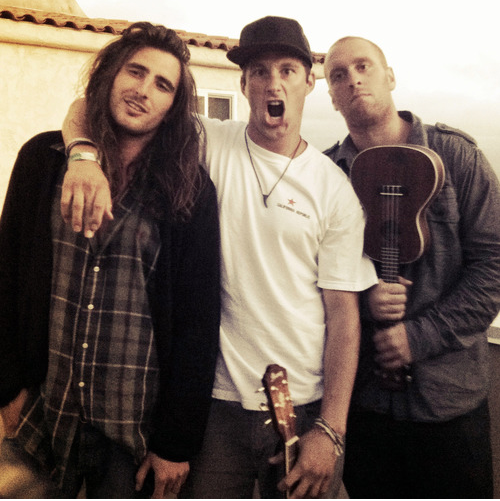 The band has made a name for itself here in Isla Vista, performing on Del Playa last fall and also headlining at Chilla Vista 2013, where they shot the music video for their song “Santa Barbara.” Hailing from the Golden State, Radical Something consists of three members: rapper and guitarist Loggy (Alex Lagemann), singer Josh Cocktail (Josh Hallbauer), and DJ and bassist Big Red (Michael Costanzo). The album opens up with the nostalgic sounds of childhood in their first track, “We Were Just Kids.” The song’s soft reggae acoustic guitar and catchy riffs accentuate the lyrics of the track, causing you to reflect on your childhood and the easy times of the past. “We Were Just Kids” is the first single off the album and sets the tone for the rest of “Ride It Out,” foreshadowing songs of relationships and blissful summer days. Their second single, “Cheap Drink,” is a fun, head-bobbing track about needing something cheap and cold on a scorching summer day to have a good time. The funky bass line and echoing guitar behind quick rapping makes this a song of summer, and it will remind you of those hot beach days on DP with friends. “Cheap Drink” is simple, fun, and an attention-grabbing song that will pull you into the whole album. The album changes pace with the sentimental tracks “Pure” and “I Miss the Hell out of You,” both of which touch on relationships. The two slower songs have lyrics that are deeper and from the heart. I liked this change of tempo, because it shows that this band isn’t just about making catchy songs that’ll get them iTunes sales, but that they want to express their feelings through their music. My favorite song on the album is the very last track, “Feels Like Forever.” I’m really into the message of this song, as it preaches the importance of friendship and to always stick together during the harder times, even if those hard times seem to last forever. Especially in these fast-paced and stressful college years, it makes you stop and think about those around you. It’s a reminder that we must always come together in order to overcome the seemingly endless challenges that face us. Radical Something has made political statements in songs on past EPs and their first album, and the band didn’t stop there. In their song “Spraypaint,” a song about expressing yourself regardless of what others think, rapper Loggy states, “And I don’t care if you’re totally straight, I don’t care if you’re totally gay.” As other rappers such as Macklemore have shown, homophobia is present in hip hop’s culture, and this statement is huge. Radical Something is taking steps toward eliminating prejudices and stereotypes altogether by spreading messages of acceptance in their music. Easy listening seems to be a common theme when it comes to the sounds of this album, and these mellow vibes are highlighted by the beautiful vocals of Josh Cocktail, smooth rapping of Loggy, and catchy samples produced by DJ Big Red. I believe that every Isla Vistan should give “Ride It Out” a listen. There is something for everyone, whether you want something calm to listen to during homework, something catchy to listen to at the beach, or something meaningful to listen to during those emotional moments of life. Radical Something has made statements with this album, and they are to live life, love each other, and take nothing for granted.